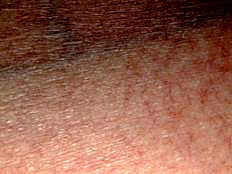 Eczema can have many causes! Mary was aged twenty and had suffered for about two years from recurrent crops of very itchy spots which she could not avoid scratching. 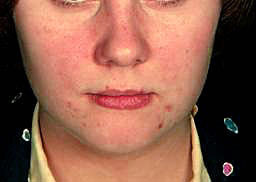 She had seen two dermatologists who had made a diagnosis of “Acne Necrotica”, but had not suggested any cause for this rare condition. She had heard that diet could cause skin problems and requested a referral for allergy investigation. There was a very strong history of various allergies on both sides of her family as far back as her great-grandfather, She had been a very colicky baby so probably had had milk intolerance in infancy. Her brother got a rash if he ate eggs, and had an aversion to milk. This story suggested that avoidance of milk products and egg was likely to be helpful. 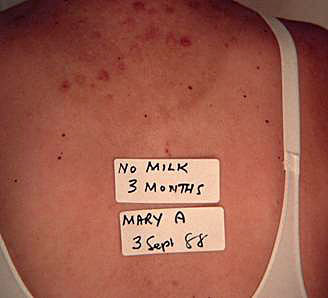 Skin and blood tests for allergies were not helpful, being negative for milk and egg. 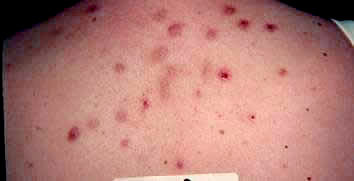 The appearance of the spots before commencing a restricted diet is illustrated below. 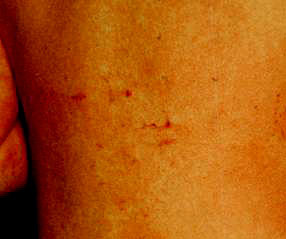 Within days of commencing an exclusion diet the intolerable itching began to decrease, and she was able to avoid scratching, which had, of course, had caused damage to the skin. 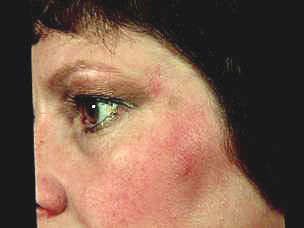 By three months her skin had almost cleared except for the scars, and she repeatedly found that if she took any milk products, egg, or citrus fruits would cause intense itching within 24 hours. She has had to be very careful about diet ever since, and has found this a social disadvantage. 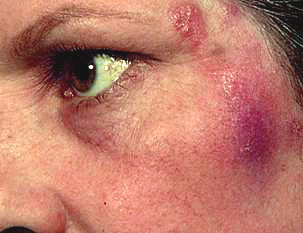 There are many Milk Products which vary a great deal in their composition, such as varieties of cheese and yoghourt, and occasionally these cause unusual skin problems which are illustrated below before and after ingestion of the product. 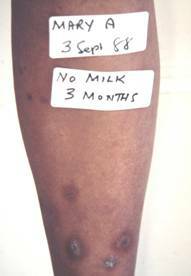 A girl aged thirteen had had eczema from early infancy, and used steroid creams regularly. Her mother had noticed that her skin was getting thinner and easily bruised, and requested an allergy referral as the skin clinic had refused skin prick tests. 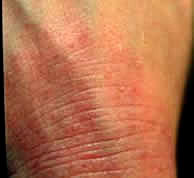 The eczema was worse round the mouth, suggesting a food was involved, and on the back of the wrists as she had a curious habit of sucking that area. The cause was the orange juice which she had had every single day since she was a baby. 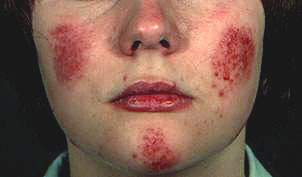 The eczema cleared completely in a few months with avoidance and no creams were required thereafter. Egg, especially the white, is a very potent allergen, and the introduction of egg into the diet of the infant should be delayed as long as possible in any family with a tendency to allergic problems. Harriet was aged four having had severe eczema for two years,.and a skin specialist could not recommend other than steroid creams. Mother wanted to find out why she had eczema. Her maternal grandfather had hay fever, her mother eczema on and off all her life, and her sister had had eczema as an infant. Her mother had tried avoiding wheat, milk, and biological washing powders without benefit, and the first clue was that Harriet got a nasty rash all over her hands after helping her mother with the baking, and she always got worse after eating chocolate. 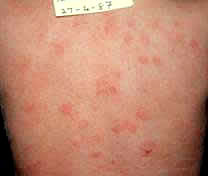 The rash was so widespread that it was difficult to find normal skin to test, and all the usual allergens were negative except for egg, which was an obvious ++++positive. She was having quite a lot of egg and chicken, and with strict avoidance she improved rapidly in a few days, but was not completely clear three weeks later. Some eczema persisted on the hands suggesting a contact allergy, in spite of many further tests and avoiding various foods, but eventually the eczema faded out completely. John was aged just two with a recent diagnosis of ‘atopic eczema’ from a dermatologist, and a recommendation to use steroid creams which the GP could have prescribed. Mother wanted to know why he had eczema which had begun behind the knees at four months just after weaning, and when he was given a little egg at five months his lips swelled so he was given no more. There was a cat in the house to which he had a positive skin test, and also egg was ++++ as expected . He was observed to react on his lips to tomato, apple, and orange, and also had a ++++skin test reaction to peanut. Avoidance of egg brought remarkable improvement as shown, proved by a flare-up after eating brioche and ice cream which both contained egg, which had not been noticed. It was then realised that an episode of swelling of face and lips for which he had been seen at A&E was due to sneaking some peanuts at a party. Another episode followed when mother lifted him by the armpits with peanut contaminated hands, causing gross skin reactions in the armpits, which he scratched with the result that he transferred some peanut to his face which swelled up like a balloon. After that peanuts were forbidden in the house. The cat was put in a cattery for a month during which the eczema improved, but relapsed as soon as it returned, so the cat was removed for good. 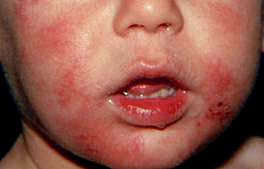 The result was that the eczema cleared completely, but the following year he developed asthma. There was no follow-up. This case illustrates how there can be several causes to what seemed to be a simple case of eczema due to egg, with the threat of peanut allergy in the background and the continuing effect of the continued presence of the cat until it was clearly shown to be part of the cause.